The Whitstable Beach Campaign made an application to Kent County Council in 2013 to secure Town Green status for a large part of Whitstable beach extending from Reeves Beach to Seasalter. In this initiative we were strongly supported by the Whitstable Society, the UKC Law Clinic and Councillor Ashley Clark. Our primary concern is to ensure access to the beach in perpetuity. At present this access could be denied by the private land-owners (or future land-owners) of the beach. This is evidenced by the recent signage warning the public that there is no right of way seaward from the footpath. Although privately owned, Whitstable beach is wholly maintained from the public purse at the cost of millions of pounds including the sea defence works (the most recent taking place in 2006/7 at a cost of £7M), the replenishment of the shingle, the replacement of the groynes and even cleaning. We believe that public access to it should be a right, not a favour. The Public Inquiry to determine the application concluded with the summings-up and final submissions in December 2016 after a 19-day hearing which included two previous sessions in May and October 2016. This is an extraordinarily long Public Inquiry reflecting the complex issues and the decision – either way – is likely to be a legal landmark. The application was made on behalf of the people of Whitstable to legitimize their right to access to the beach in perpetuity, irrespective of its private ownership. We are awaiting the outcome of the Inspector’s findings and will update this web page when they are published. In the October 2016 session, Mr James Green of the WOFC gave as one of his reasons for opposing the right of people to carry out legal pastimes and pursuits on the beach, the possibility of organisms being brought onto the beach via the footfall of beach users, which would contaminate the oyster stocks of the WOFC. The Beach Campaign do not believe that there is any sound scientific basis or regulatory requirement to support this claim. In the process of preparing the application we collected over 400 witness statements from within the parish of Whitstable from people who have used the beach during the 20-year period from 1992 to 2012. Due to recent changes in Village & Town Green legislation this might be the last chance to register our beach as a Town Green and safeguard people’s right to use it. Applications have previously been made by veteran campaigner Anne Wilkes (with the support of the Whitstable Society) in 1968 and 2002 and she successfully claimed Village Green status for some sections of the beach, but not for all of it. The current application land stretches from Daniel’s Court to Reeves Beach and includes West Beach. The Public Inquiry for the Whitstable Beach Campaign’s application to register Whitstable beach as a Town Village Green commenced its first hearing at The Marine Hotel, Marine Parade, Tankerton starting at 10am on 3rd October for 3 days: Monday 3rd, Tuesday 4th and Wednesday 5th and then continued the following Monday 10th for 3 further days; Monday 10th, Tuesday 11th and concluded Wednesday 12th. 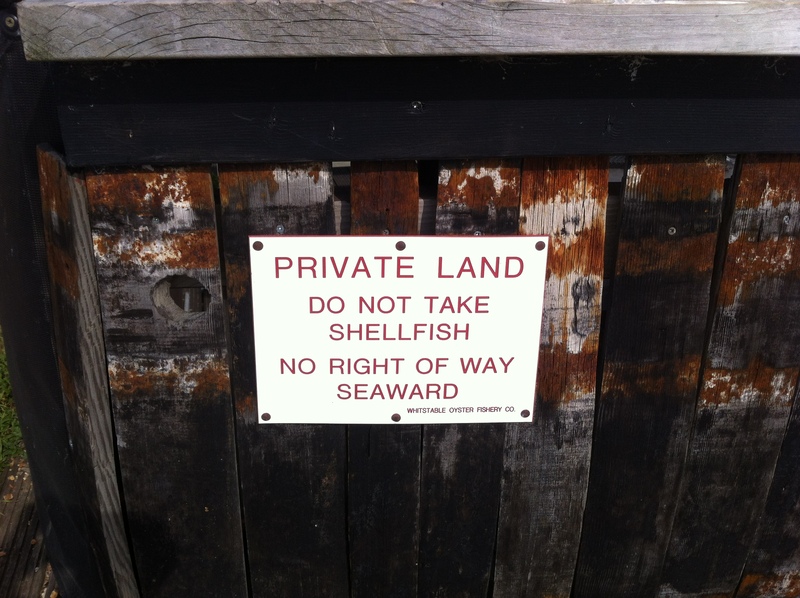 The Beach Campaign applied to register the beach in September 2013 after Whitstable Oyster Fishery Company (WOFC) notices appeared on many of the Groynes near the High Water mark saying: ‘PRIVATE LAND, DO NOT TAKE SHELLFISH, NO RIGHT OF WAY SEAWARD’. The Campaign was very concerned that these notices posed a serious threat to people’s use of the beach. They effectively warn that no-one has the right to go beyond the position of the notice and therefore access to the sea for swimming or paddling etc, is private and out-of-bounds. The Inquiry heard evidence from 13 witnesses including Councillor Ashley Clark in support of the application and witnesses from Canterbury City Council (CCC). CCC’s objection was on sea defence grounds but CCC strongly support the Beach Campaign’s case that a “natural right” exists for people to access the beach and both the Beach Campaign and the Council have produced evidence that the beach has been used for recreational purposes from about 1738, when a news article referred to the first bathing machines. CCC barrister, Mr Wilmhurst, argued that in more recent times the beach has effectively been under the control of the local authority as the beach defences are wholly maintained by CCC at taxpayer’s expense, as is the beach cleaning, safety and information signs and all the foreshore services. CCC also supports the events that take place on the beach; the Biennale etc, and the beach is also insured by CCC. So it is understandable that members of the public believe that the Council, not the WOFC, owns the beach. Photograph submitted by WOFC to Inquiry as an example of the type of Agricultural Shed they propose to build on beach. 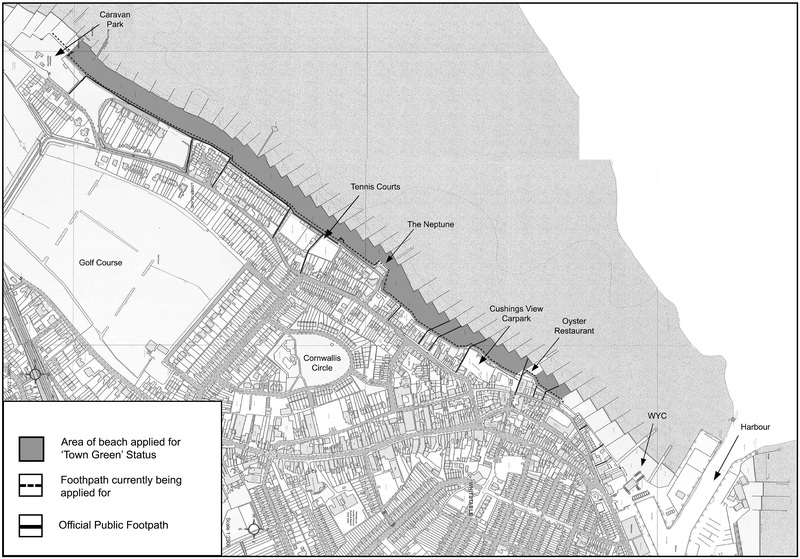 The Beach Campaign have submitted evidence which shows that industrial premises on the East Quay owned by the WOFC and previously used for grading oysters and also incorporating an education centre were granted change of use following an application by WOFC. The premises now operate as a restaurant, late night music venue and bar. One of the evidence documents submitted by Canterbury City Council was a statement to the Inquiry from the CCC planning department. It details numerous international, national, local designations and policies that combine to protect Whitstable beach and ensure that inappropriate development does not take place. According to the Council, Whitstable beach is now classed a Flood Zone 3b, the highest category as defined by the Environment Agency. It is therefore considered a functional flood plain and therefore ‘no development will be permitted unless exceptional justification can be demonstrated’. Legal representations were made by CCC barrister, Mr Wilmhurst, QC Vivian Chapman representing the WOFC and lastly George Laurence QC representing the Whitstable Beach Campaign. The Beach Campaign also receive enormous legal support from Solicitor Elaine Sherratt and students at Kent Law Clinic. The Whitstable Beach Campaign would like to thank the many people of Whitstable and further afield who supported us at this important inquiry. Never before have the people of Whitstable been denied access to their beach, access has always been free and unrestricted throughout the Town’s history. Public funds have created our current beach, public funds maintain, repair, clean and insure it. Any attempt to deny access must be prevented. Town Village Green status is the best way to secure access now and for future generations.